The present bus system has to be seen in the context of the history of Bangalore and its development as a city. The original city has a clearly and visibly bifurcated development with a Cantonment area controlled by the British Raj and a Western area under the control of the erstwhile Maharaja of Mysore. Two centres developed with one around Shivaji Nagar and the second around what is today called K R Market or Kalasipalayam. Subsequently, the creation of the City Railway Station and the formation of the Bus Station led to a third centre within the city. The current bus system was designed to serve the needs of this original city layout. However, the urban sprawl that has been created through an almost relentless growth in the city from the 1960’s has resulted in the existing model of bus transport not being able to support the growing needs of the city. The population of Bangalore has grown exponentially in the last twenty years on the back of what is described as the Information Technology (IT) boom. The dramatic increase in the number and the scale of IT has created growing opportunities especially for the increasing middle class. The flip side to the growing of the city has been the prolific growth in private vehicles. The class of vehicles that have grown substantially are the two wheelers growing almost 1000% in the past twenty years. In the same period, there has been no corresponding increase in road area thereby causing extreme congestion. The responses to increasing levels of congestion in the city have included measures to increase the carrying capacity of the roads through the imposition of one-ways, widening of roads (through narrowing of footpaths) and construction of flyovers in order to alleviate congestion. While all these measures have resulted in some relief to commuters, the inability to have a systematic method to reduce private vehicles and encourage the use of public transport continues to cause increasing levels of congestion within the city. One ways are a temporary solution until the next crisis when the number of vehicles continues to increase in order to service the needs of areas. Flyovers that are being constructed are not always designed for public transport users resulting in bus users being further discouraged from their use. For example the lack of a bus stop on the existing Mysore Road flyover and also the proposed Hennur Road flyover means that many commuters who live or work alongside the flyover will be forced to walk additional distances in order to catch a bus. Innovations to increase bus usage might require retro-fitting of bus stops onto flyovers with pedestrian ramps for people to get to these bus stops. Public transport currently is predominantly destination oriented to one of the three city centres which each city centre serving a different area. This causes most areas apart from those within the centre of the city to be connected with a very poor frequency of buses. This further discourages the use of public transport thereby increasing the number of private vehicles even more. The BMTC buses have also been relegated to a lower rung in the hierarchy with the traffic police responding to higher congestion with restrictions on movements of BMTC buses and autorickshaws thereby penalising those using public transport while further (indirectly) promoting the use of private transport. In addition to the fact that most areas have a destination oriented bus system, the location of the area will usually determine the destination of the bus itself. There are about 140 terminating points or end points in the city. From each of these end points, buses are operated to the three Central points KBS, KRM and Shivajinagar (about 350 routes), and only a few routes (about 50) are operated from some points to other without touching any central point. In addition to the fact that most buses are destination oriented, all three terminuses do not provide an equal frequency of buses to all parts of the city. The northern and eastern parts of the city are serviced mainly by the Shivaji Nagar Bus Terminus. The south and south west by the K R Market Bus Terminus while the Kempe Gowda Bus Terminus serves the western and North Western parts of the city. This creates some strange anomalies during the use of the present bus system. 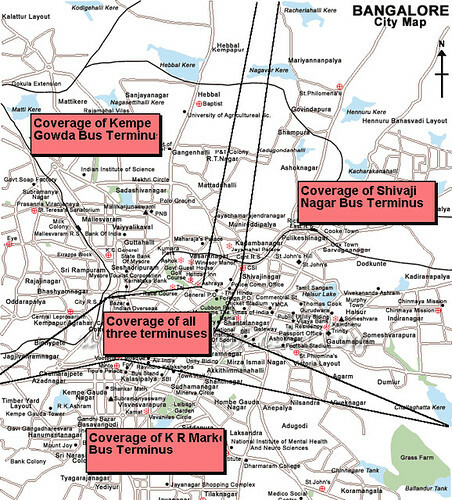 The original three city centres connected by the BMTC are generally well connected subject to the limitation given above. However, given this limitation, the result has generally been a public transport system that services people who’s main needs are based around the three central points. The beneficiaries of this system are government employees who’s offices are in the area of the city centre, students (generally of government schools and colleges in the area) and people coming in to the markets at either K R Market or Shivaji Nagar. Historically, the location of the bus stops also helped to service the medical needs of people visiting the city for a day. Typically, traders or farmers who have come in to sell their produce within the city. Vani Vilas Hospital, Victoria Hospital, Bowring Hospital and St. Johns Hospital among others are located very close to an important market and also a strategic bus terminus. The good connectivity of the city centre is shown in the figures below. Despite the BMTC operating nearly 3200 buses with a similar number of schedules covering 45,000 trips, completing around 7 lakh service kilometres per day is unable to increase its share of commuter traffic much beyond 50%. The remaining take private transport or walk to their place of work or study. This is partly a result of poor connectivity to any part apart from the three key destinations. In addition to the fact that this kind of system requires more buses, it causes an ‘under-utilisation’ of capacity everywhere except the extreme periphery of the city. The information technology boom has created an additional set of challenges for the city. The increase in number of quasi legal chartered services to transport people to their places of work especially in the night has dramatically increased the number of Sports Utility Vehicles like Tata Sumo and Toyota Qualis. This fragmentation of transport needs further increases congestion within the city and at the same time many of these vehicles are emerging with a reputation for being ‘road bullys’. The relative affluence of the two wheeler driving class also means that ensuring that they do make a change to public transport will require better service levels and greater levels of comfort. This might call for the BMTC to further develop and differentiate its services with air conditioned and/ or express services to grab a larger pie of the commuting population. In addition to the fact that connectivity to the centre of the city is good but poor everywhere else is the fact that different areas get serviced based on where it is relative to the central city bus terminus. Travel within the same zone (area serviced by a terminus as highlighted above) is relatively simple and is possible without much problem. However, if travel has to be made outside the zone, it can often involve taking up to three buses or involve an extraordinary amount of waiting time. The third bus is to travel between one of these terminuses. The result therefore is poor connectivity thereby causing many people to prefer private transport to the public bus. Hence This Task Force is of the opinion that the key to improving commuter comfort is to improve connectivity as a first and necessary step. When this step is taken in conjunction with a large number of other measures, it can help to increase the comfort of the passengers travelling on public transport beyond the 50% market share of public transport, which it has failed, to breach. It is also important that the BMTC set an external benchmarked target (like 60% commuter market share by 2006) or some other method in order to move in a specific measurable manner, which can act as a barometer of passenger comfort in Bangalore. This is radically different from the current system where success is measured through the number of buses operated or the financial viability of the Corporation. The challenges facing the BMTC are many and the solutions cannot be seen as piecemeal. It has to be a part of an integrated transport package that results in a significantly better travelling experience for the commuter. It on the one hand requires the BMTC to improve services to take care of needs of people who currently use private transport. It also requires the Corporation to work together with other stakeholders like the Bangalore Mahanagara Pallike (BMP), the Bangalore Development Authority (BDA) and the Bangalore Traffic Police (BTP). The Task Force suggests that a single transport agency be created with a transport policy statement to ensure that all issues with regard to land use, planning and transport are part of an integrated solution to improve the daily travelling experience of the commuting public. This Task Force is also of the opinion that public transport should be given priority over all other modes of transport. This necessarily requires involving other stakeholders in a dialogue with the solution of the transport crisis as the objective rather than any other objective. Priority for public transport could be through a variety of means and a few of these are outlined in the report. Making a more efficient public transport system is a necessary carrot while other measures could include banning of all private vehicles on select roads during peak hours, higher parking charges, peak hour congestion charges and priority bus lanes. naveen that is a very interesting idea that you have been suggesting for a while now. will get back to you on that. just wanted to let you know that i agree. Oppurtunity to correct historical descrimination ! As always the weaker always gets the raw deal. Whether benefiting from government services like hostpitals, parks, travel resources or natural resources, the weaker seems to be the real loser. There are areas in B'lore historically (Tannery Road, Kavala Byrasandra, Neelsandra etc) had poor BMTC service. Places like Jaynagar, Rajajinagar, Malleswaram was well serviced with the BMTC busses. I am sure the trend continues. We need to correct these anomolies. Every part of the city must be equally fed with the connectivity services. Let's not descriminate them because they are poor and socially not empowered. CCTF Report - An Oppurtunity ? A single transport agency - this is an urgent need - a lot of agencies are holding pieces of the pie & have been pursuing their own ends with no proper co-ordination. Recognition of priority for public transport with measures such as banning of all private vehicles on select roads during peak hours, higher parking charges, peak hour congestion charges and priority bus lanes - this is an important observation ! Hope this is taken note of seriously & implemented. Improving connectivity - this will likely happen anyways, as Metro will fill in the connectivity to Majestic & City Market, whilst BMTC will steer to connect suburbs with one another, & to the metro stations. Magic boxes are a potential tool & should be considered for use for only public transport . These seem almost ready-made for the job - narrow, quick & easy to install & inexpensive. To make public transport preferrable, it must combine time & cost savings with comfort, convenience & reliability - the only way this can be done is to ensure that it moves quicker than the competition (private vehicles), whilst providing the same level of comfort, else it's a dead duck ! Hope we see some action along these lines ! This is a part of the report by commuter comfort task force that was co-chaired by muralidhar rao, who was also kind enough to share the document with us. We are posting the extracts of the report in parts for convenience. eventually we will post most of the 59 page report.